So it was my 21st birthday last week and as a treat my boyfriend took me to London to do some sightseeing. It was a really great day. Of course I couldn't let a day like that pass without doing my nails. Sorry for the nasty dark photos, I took these shots quickly on the train, hoping to take some more later but the Models Own polish I used was chipped by the end of the day. 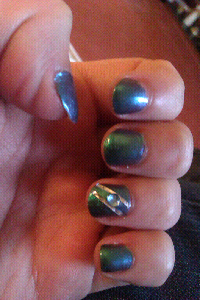 So for this I used Models Own Aqua Violet from the new Beetlejuice collection. I do love this polish apart from the fact that it chips so easily. You can just about see the purple undertones in this photo. 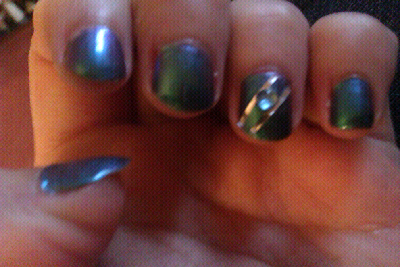 I also used some silver striping tape and a blue rhinestone on my accent nail. This was the first time I have used striping tape and I am very happy with the easy application and result. I had a great day and loved having great nails! they look really cute! 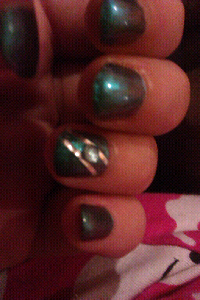 I love using Aqua Violet over black, it also looks awesome with Sally Hansen DVD on top! Glad you had a Happy Birthday!